Although delirium often recedes, it may have long-lasting aftereffects. A recent study published online in General Hospital Psychiatry found that hospital delirium can contribute to premature death. Among people over age 65 admitted to a general hospital, those diagnosed with delirium were more likely to die within one year than those without delirium. The findings echo those in an analysis published last year in The Journal of the American Medical Association (JAMA) that found a link between hospital delirium in elderly people and poorer outcomes, including death, dementia, and institutionalization (such as in a nursing facility) within one to four years. 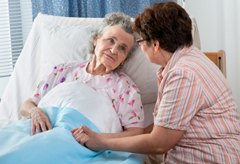 Hospital delirium is especially common among older people who’ve had surgeries such as hip replacement or heart surgery, or those who are in intensive care. Anything that interferes with neurotransmitters—the brain chemicals that communicate between nerve cells—can trigger it, including inflammation, infection, and medications. Also implicated are a host of potentially disorienting changes common to hospital stays, including sleep interruptions, unfamiliar surroundings, disruption of usual routines, separation from family and pets, and being without eyeglasses or dentures. Make sure that hospital personnel have a complete list of all the medications the person is taking, including over-the-counter medicines. Make things familiar for the person. Take a few family photos or other favorite things (such as a blanket, rosary, book or music tape) to the hospital. If someone develops hospital delirium, stay with him or her in the hospital as much as possible, including at night. In addition to providing comfort and reassurance, family members are more likely than others to recognize when their loved one isn’t behaving normally or being treated appropriately. Make sure the person has his or her eyeglasses, hearing aids, or dentures. These are often put away during a hospital stay, but that can contribute to disorientation. Promote physical and mental activity. Help the patient get up and walk two or three times a day. Engage in quiet conversation about current events or family activities. Play card games or do crossword puzzles together. My grandmother fell out of her hospital bed and broke her hip because of delirium in the hospital. I’m going to give her this to read. Insightful blog,this is a great article which covers a very real problem. Thanks for this useful information. excellent post with great resources. I am sincerely impressed with the depth and empathy of this article. Ms.Schatz has presented a really interesting and informative take on this terrible disease. Thank You. Great post! Thanks for highlighting the dangers of hospital delirium. As an old ICU nurse, I feel this issue doesn’t get the attention it deserves. Thanks again! This is a great article which covers a very real problem – thank you. The elderly seem to find security in the familiar and keeping them connected to what they are familiar with makes all the difference. After caring for both my mother and grandmother for a number of years I can honestly say that your advice is spot on. This is by far one of the most comprehensive posts i’ve seen here and look forward to more of the you have always nice things to post. Thanks for this useful information. excellent post with great resources! This is by far one of the most comprehensive posts i’ve seen here.Keep us updated about this I would like to hear more on this topic!